Modern western society is more medicated than at any time before in history. At Prime Health Products, we believe health and wellness come from nourishing your body with exercise, a healthy diet, and traditional herbs, not by over-medicating yourself with pharmaceutical drugs. Prime Health Products was founded by Julia Chang, MSc., 21 years ago. We manufacture our own herbal tinctures, and we also sell other herbal and health products, as well as recommending diet and lifestyle changes to help people achieve better health and wellness. One particular area of focus for us has always been liver and gallbladder health. The liver and gallbladder are extremely important to the overall functioning of your body. It could even be said that the liver is to your body what a fuel filter is to a car. Therefore, we believe that by strengthening, cleansing, and nourishing the liver and gallbladder, you can improve your health in myriad ways. Our tinctures are made the traditional way: hand-picked herbs are mixed with water and alcohol, then allowed to mix for weeks. No heating elements or radiation are used: just time and patience. The solids are removed using traditional gravity filtration: there are no mechanical or electrical pumps which can introduce oil and other impurities into the solution. My Journey of Self-Healing, by Julia Chang. Y-Dan - a simple, low-stress alternative to Tai-Chi exercise. Learning Resources - useful resources you can use to educate yourself about approaches to natural healing and wellness. We now carry Enerex herbal products. The Enerex line of high-quality nutritional supplements is manufactured in beautiful British Columbia, Canada using all-natural ingredients, and is formulated to treat a variety of health problems. 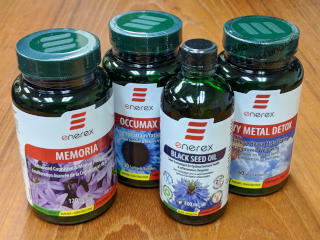 We currently carry four varieties: Black Seed Oil, Memoria, Occumax, and Heavy Metal Dexox. Click here to learn more, or click here to see our full product lineup. In order to serve you better, we are now open from 10AM to 5PM on Saturdays, but we are closed on Mondays. Based on customer feedback, we determined that Saturdays are more important than Mondays, in terms of customer convenience.